Jürgen Habermas (born June 18, 1929) is a German philosopher, political scientist, and sociologist in the tradition of critical theory, best known for his concept of the "public sphere." His numerous and complex writings span many aspects of social theory, and constitute his effort to advance the Enlightenment project to develop human society based on our rational faculty, and thus free people from irrational superstition and intolerance. He has warned that society faces a crisis, as our "life-world," in which our shared values and practices are developed and constantly reaffirmed through communicative action, has increasingly been dominated by administrative and economic systems that preclude the chance for such communication. Nevertheless, Habermas has remained optimistic that the "public sphere" can be redeveloped, and human society can advance to a better state, founded on common understanding, caring for the needs of all its members. Jürgen Habermas was born in Düsseldorf, Germany, in 1929. His father, a director at the local seminary, was involved in the Nazi regime, and encouraged his son to join the Hitler Youth. Habermas was sent to the western front in the last months of WWII, when he was only 15 years old. After the Nuremberg trials, where the secrets of the concentration camps were revealed, Habermas came to realize the true nature of Nazi regime, something he had been fighting for. He was also horrified at how easily former Nazis, who had perpetrated such atrocities, were able to resume life in Germany society, acting as if nothing had happened. This experience changed his life, and is reflected in his philosophical works on political systems. After the war, in 1946, Habermas enrolled in the University of Bonn. There, he came under influence of thinkers such as Karl Marx, Hegel, and Georg Lukacs. He received his Ph.D. in 1954. Habermas burst onto the German intellectual scene soon after, with an influential critique of the philosophy of Martin Heidegger. Habermas had studied philosophy and sociology at the Johann Wolfgang Goethe University of Frankfurt am Main since 1956, under critical theorists Max Horkheimer and Theodor Adorno. However, because of a rift over his dissertation between the two—Horkheimer believed that Habermas was too radical and had made unacceptable demands for revision—as well as his own belief that the Frankfurt School had become paralyzed with political skepticism and disdain for modern culture, he took his Habilitation in political science at the University of Marburg under Wolfgang Abendroth, one of the new Marxist professors in Germany. In 1961, Habermas became a privatdozent in Marburg, and in an unusual move for the German academic scene at that time, he was called to an "extraordinary professorship" of philosophy at the University of Heidelberg (at the instigation of Hans-Georg Gadamer and Karl Löwith) in 1962. 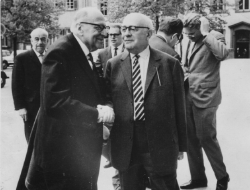 In 1964, strongly supported by Adorno, Habermas returned to Frankfurt to take over Horkheimer's chair in philosophy and sociology. He accepted the position of director of the Max Planck Institute in Starnberg, (near Munich) in 1971, and worked there until 1983, two years after the publication of his masterpiece The Theory of Communicative Action. Habermas then returned to his chair at Frankfurt and the directorship of the Institute for Social Research. In 1986, he received the Gottfried Wilhelm Leibniz Prize of the Deutsche Forschungsgemeinschaft, which is the highest honor awarded in German research. He was also appointed Permanent Visiting Professor at Northwestern University in Evanston, Illinois, in the United States. Since retiring from Frankfurt in 1993, Habermas continued to publish extensively. Habermas visited the People's Republic of China in April 2001, and received a warm welcome. He gave numerous speeches under titles such as "Nation-States under the Pressure of Globalization." Habermas was also the 2004 Kyoto Laureate in the Arts and Philosophy section. He traveled to San Diego, and on March 5, 2005, as part of the University of San Diego's Kyoto Symposium, gave a speech entitled "The Public Role of Religion in Secular Context," regarding the evolution of the separation of Church and State from neutrality to intense secularism. He received the 2005 Holberg International Memorial Prize. Habermas was one of the second generation of philosophers and social theorists in the Frankfurt School whose members included Horkheimer, Adorno, Walter Benjamin, Erich Fromm, and Herbert Marcuse. In the Dialectic of Enlightenment, Horkheimer and Adorno, members of the first generation of theorists, expressed their distrust of rationality and argued that rationality inherently had moments of cruelty and violence. Citing Greek mythology, specifically the Odyssey, they argued that the story illustrates the tragic outcome of reason. The myth describes Odysseus’s journey from Troy (barbarous land) to Greece (land of reason), and upon arrival to the land of reason, Odysseus carries out a massive slaughter. Thus as exemplified in the myth, violence was an inherent part of rationality. The Holocaust and Stalin’s mass murders are examples in modern society of the massive destructive power of reason and the quest for rationality. However, against Horkheimer and Adorno’s pessimistic distrust, disappointment, and criticism of rationality, Habermas attempted to re-construct rationality on grounds different from his predecessors. Society can be viewed through two different perspectives. First, similar to the structuralist perspective, society can be seen as an autonomous, self-regulative system, which has its own mechanisms regardless of the views and ideas of its constituent members. In the second view, which is comparable to a phenomenological view as opposed to viewing society as a system, society can be conceived as a field in which its constituent members communicate and work together. This realm of communication and action is called an inter-subjective life-world. The first perspective views society as a whole from an external perspective and the second perspective views society as a dynamic inter-relational field from the perspective of its constituent members inside of the society. Society exists by maintaining a balance between these two complementary aspects of system and life-world. Habermas argued that in modern society the systematic element dominated the life-world element (“colonization of life-world”) and pathological social problems such as alienation was produced. Powerful social systems such as the nation and the capitalist economic system dominated society and thus alienated human beings. Habermas tried to reverse this order by restoring the primacy of the “practical” reasoning of the life-world over the instrumental or functional reasoning of social systems through the establishment of communication based notions of rationality. Habermas analyzed that rationality in the modern age became either functional or instrumental. However, he presented a different kind of rationality predominant in communication in the life-world. Rationality in communication presupposes implicit consent among agents regarding truth, legitimacy, and honesty. Truth in communication, for example, is confirmed by agreements among participating members. Habermas did not conceive rationality neither as an extra-contextual, independently existing power nor as a principle existing in the objective world. He placed rationality within the realm of communication, which was formed by multiple participants, and certain coercive power is necessary in order to maintain social order and norms. Thus, Habermas argued that rationality is a social power that was based upon internal agreements among agents, that are reachable through communication; and communicative rationality should replace the power of the social system in the forms of political institutions (i.e., the nation) and the capitalist economy. Habermas’s expectation and trust of reason or rationality shows a sharp contrast with Jean-Francois Lyotard’s (see Postmodernism) attitude and distrust of reason and truth as being illusionary. While Habermas attempted to work within the broader framework of modernity, which is characterized by rationality, Lyotard tried to develop his thought outside of this framework of modernity. Habermas' writings are complex, focusing on such varied themes as the foundations of social theory and epistemology; the analysis of advanced capitalist industrial society and of democracy; the rule of law in a critical social-evolutionary context; and contemporary, especially German, politics. He developed a theoretical system devoted to revealing the possibility of reason, emancipation, and rational-critical communication embedded in modern liberal institutions, and in the human capabilities to communicate, deliberate, and pursue rational interests. Jürgen Habermas considers his own major achievement to be the development of the concept and theory of "communicative reason" or "communicative rationality," which distinguishes itself from the rationalist tradition by locating rationality in structures of interpersonal linguistic communication rather than in the structure of either the objective world or the knowing subject. This social theory advances the goals of human emancipation, while maintaining an inclusive universalist moral framework. This framework rests on the argument called universal pragmatics—that all speech acts have an inherent telos (the Greek word for "purpose" or "goal")—the goal of mutual understanding, and that human beings possess the communicative competence to bring about such understanding. Habermas carried forward the traditions of Kant and the Enlightenment and of democratic socialism through his emphasis on the potential for transforming the world and arriving at a more humane, just, and egalitarian society through the realization of the human potential for reason, in part through discourse ethics. While he conceded that the Enlightenment is an "unfinished project," he argued it should be corrected and complemented, not discarded. In this he distanced himself from the Frankfurt School, criticizing it and much of postmodernist thought for excessive pessimism, misdirected radicalism, and exaggeration. Within sociology, Habermas' major contribution is the development of a comprehensive theory of societal evolution and modernization, focusing on the difference between communicative rationality and rationalization on the one hand and strategic/instrumental rationality and rationalization on the other. Habermas sees the rationalization, humanization, and democratization of society in terms of the institutionalization of the potential for rationality inherent in the communicative competence that is unique to the human species. Habermas believes communicative competence has developed through the course of evolution, but in contemporary society it is often suppressed or weakened by the way in which major domains of social life, such as the market, the state, and organizations, have been given over to, or taken over by, strategic/instrumental rationality, so that the logic of the system supplants that of the Lebenswelt (life-world—the lived realm of culturally-grounded relationships and identities). His defense of modernity and civil society has been a source of inspiration to others, and is considered a major philosophical alternative to poststructuralism. He has also offered an influential analysis of late capitalism. Jürgen Habermas wrote extensively on the concept of the "public sphere," using accounts of dialogue that took place in coffee houses in eighteenth century England. Habermas argued that it was this public sphere of rational debate on matters of political importance, made possible by the development of the bourgeois culture centered around coffeehouses, intellectual and literary salons, and the print media that helped to make parliamentary democracy possible, and which promoted Enlightenment ideals of equality, human rights, and justice. The public sphere was guided by a norm of rational argumentation and critical discussion, in which the strength of one's argument was more important than one's identity. Habermas described this sphere in terms of both the actual infrastructure that supported it, and the norms and practices that helped the critical political discourse flourish. He distinguished between looking at the public sphere as a concept and as a historical formation. In his view, the idea of the public sphere involved the notion that private entities would draw together as a public entity and engage in rational deliberation, ultimately making decisions that would influence the state. As a historical formation, the public sphere involved a "space" separated from family life, the business world, and the state. According to Habermas, a variety of factors resulted in the eventual decay of the bourgeois public sphere of the Enlightenment. Most importantly, structural forces, particularly the growth of a commercial mass media, resulted in a situation in which the media became more of a commodity—something to be consumed—rather than a tool for public discourse. In his magnum opus, Theory of Communicative Action (1985) he criticized the one-sided process of modernization led by forces of economic and administrative rationalization. Habermas traced the growing intervention of formal systems in our everyday lives as parallel to development of the welfare state, corporate capitalism, and the culture of mass consumption. These reinforcing trends rationalize widening areas of public life, submitting them to generalizing logic of efficiency and control. As routinized political parties and interest groups substitute for participatory democracy, society is increasingly administered at a level remote from the input of its citizens. As a result, boundaries between public and private, the individual and society, the system and the life-world deteriorate. Democratic public life only thrives where institutions enable citizens to debate matters of public importance. He described the "ideal speech situation," where actors are equally endowed with the capacities of discourse, recognize each other's basic social equality, and in which their speech is completely undistorted by ideology or misrecognition. Habermas promotes the human ability for "communicative action:"
Habermas, however, remained optimistic about the possibility of the revival of the public sphere. He sees hope for the future in the new era of political community that transcends the national state, based on ethnic and cultural likeness, into one based on the equal rights and obligations of legally vested citizens. This discoursive theory of democracy requires a political community which can collectively define its political will and implement it as policy at the level of the legislative system. This political system requires an activist public sphere, where matters of common interest and political issues can be discussed, and the force of public opinion can influence the decision-making process. Criticisms of Habermas' notion regarding the public sphere have been expressed by several noted academics. John Thompson, sociology professor at the University of Cambridge, pointed out that Habermas' notion of the public sphere is antiquated due to the proliferation of mass media communications. Michael Schudson, from the University of California in San Diego, argued more generally that a public sphere as a place of purely rational independent debate never existed. Habermas is famous as an outspoken, public intellectual. Most notably, in the 1980s he used the popular press to attack historians Ernst Nolte and Andreas Hillgruber, who, arguably, had tried to demarcate Nazi rule and the Holocaust from the mainstream of German history, explaining away Nazism as a reaction to Bolshevism, and partially rehabilitating the reputation of the Wehrmacht (German Army) during World War II. This so-called Historikerstreit ("Historians' Quarrel") was not at all one-sided, because Habermas was himself attacked by scholars including Joachim Fest and Klaus Hildebrand. Habermas has continued to be outspoken, as in his opposition to the invasion of Iraq in 2003. Habermas and French philosopher Jacques Derrida (see his Deconstruction) engaged in somewhat acrimonious disputes, beginning in the 1980s, that culminated in a refusal to continue the communication. Following Habermas' publication of "Beyond a Temporalized Philosophy of Origins: Derrida" (in The Philosophical Discourse of Modernity), Derrida, citing Habermas as an example, remarked that, "those who have accused me of reducing philosophy to literature or logic to rhetoric … have visibly and carefully avoided reading me" ("Is There a Philosophical Language?," 218, in Points…). Others prominent in deconstruction, notably Jean-François Lyotard, engaged in more extended diatribes against Habermas, whereas others, such as Philippe Lacoue-Labarthe, found these polemics counterproductive. In the aftermath of 9/11, Derrida and Habermas established a limited political solidarity and put their previous disputes behind them, in the interest of "friendly and open-minded interchange," as Habermas put it. Derrida was already extremely ill by the time the two had begun their new exchange, and the two were not able to develop this such that they could substantially revisit previous disagreements or find more profound terms of discussion before Derrida's death. Nevertheless, this late collaboration encouraged other scholars to revisit the positions, recent and past, of both thinkers, vis-à-vis the other. Habermas influenced numerous philosophers and sociologists. Among his most prominent students have been the political sociologist Claus Offe (professor at Humboldt University of Berlin), the sociological theorist Hans Joas (professor at the Free University of Berlin and at the University of Chicago), the theorist of societal evolution Klaus Eder, the social philosopher Axel Honneth (director of the Institute for Social Research), and the American philosopher Thomas A. McCarthy. His conceptualization of the life-world as the symbolic level of shared value commitments, formed in the "public sphere," that is the essential, underlying legitimization of economic and administrative systems has provided new insight into social theory. He has warned of the crisis that society faces, due to the "colonization" of the life-world by the system, reducing qualitative values to quantitative evaluations—how many (customers, patients, hamburgers) served each day—precluding the necessary communicative actions that reaffirm the very values upon which the system operates. Although critical of capitalism, Habermas never fully embraced Marxism, preferring to view democratic capitalism optimistically as an "unfinished project." He has maintained his belief that this project can and should be completed, as part of the Enlightenment effort to develop a true society based on the human rational capacity, free of irrational superstition and intolerance. His work is his effort to describe how that may come about. Braaten, Jane. 1991. Habermas's Critical Theory of Society. State University of New York Press. Bennington, Geoffrey. 1996. "Ex-Communication". University of Sussex. 4 March 1996: round table with Peter Dews and William Outhwaite. Mendieta, Eduardo. America and the World: A Conversation with Jürgen Habermas. logosjournal.com. Retrieved April 30, 2008. 'Dear Habermas' academic journal Journal of Postmodern and Critical thought. This page was last modified on 15 June 2018, at 16:25.